Despite the social changes which have occurred as a result of one ever more increasingly technological world, the sound of the tower bells still occupy a much respected and important place in western society. The aim of our website is to highlight the depth and richness of the bell ringing tradition in the province of Bergamo (North of Italy). From a general point of view, it can be said that ancient towns such as Verona, Genoa and Bologna, not to mention countless small villages scattered across mid-Italy, possess bellfries with bells which have rung out for centuries accompanying the people of times past and present, in times of sorrow and joy, on the journey through the Christian milestones that so structure our lives at every level. In particular, two mountain valleys north of Bergamo, a picturesque town set in the very heart of Lombardy, about 25 miles east of Milan, boast a unique bell ringing tradition that has been preserved since the mid 18th century, having been passed down orally, from generation to generation of bell ringers, to the present. In an attempt to preserve and to celebrate this precious musical heritage, ringers from a local council (Federazione Campanari Bergamaschi) have joined together in order to preserve a small but significant part of their repertoire. Our website han been specially devised to let bellringers from all over the world know how we play bells. In the province of Bergamo there are three types of ringing: change ringing (suono ‘a distesa’), carillon (suono ‘a tastiera’) and ‘romana’. 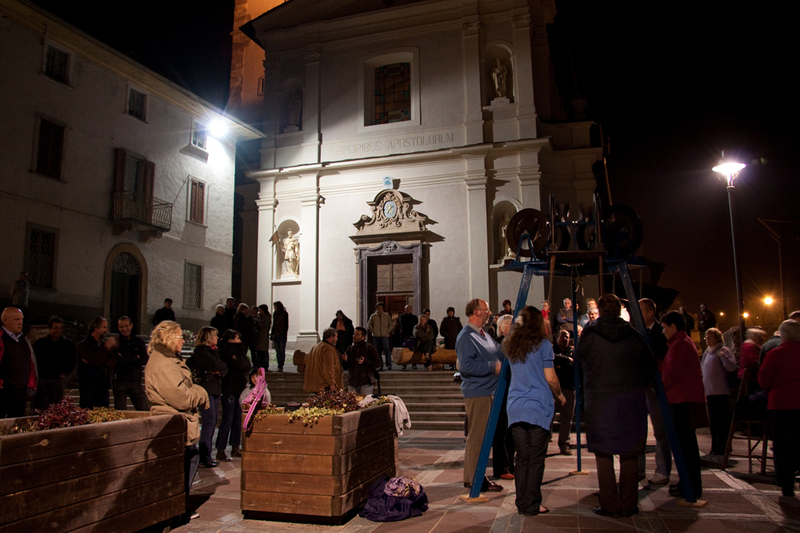 Change ringing in Bergamo valleys (which is technically distinct from its English namesake) is performed by bands of young and old ringers following the instructions of their leaders. 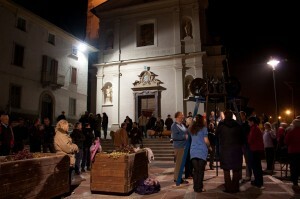 It consists in pulling down the ropes tied to the bell wheels until the bells are upside down, mouth upwards, and then lowering them until the clappers strike and sound the bell. The sequences played by bell ringers produce melodic phrases which emphasise the solemnity of the Christian festivals in course. Carillon tunes are played from rudimental keyboards made of rough wooden keys whose number (from three to twelve) depends on the number of bells in the bellfry. The Bergamo Carillon repertoire includes dances dating from XVI and XVII centuries and a wide selection of waltzes, polkas and mazurkas, with a representative collection of religious songs. Finally the ‘romana’ style, which differs from change ringing in Rome, is composed of a lively sequence of melodies played from a keyboard involving 4 or 5 bells, followed closely by change ringing. Besides the bells, most ringers still enjoy practising keyboard sonatas on their ‘campanine’, a special kind of folk xylophone consisting of a series of brass or glass bars and metal tubes which are struck with small wooden hammers to imitate bells. 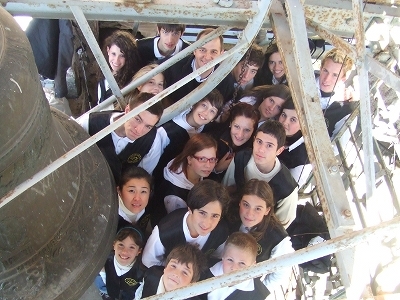 Ringers from Leffe and Albino, along with the pupils of Scuola Campanaria di Roncobello (Bell Ringing Academy), have explored and saved the richness of the music that has delighted and entertained audiences for decades. Our CDs illustrated in this website bear testimony to the enduring and timeless quality of the bells in its appeal to audiences from all over the world. Thank you for visiting. For further information please contact our mail. All replies shall be in English. If you have pain to understand Italian or if you don’t know it at all, please write us. We’ll try to explain you something more about our tradition. 51 Raduno Nazionale Suonatori di Campane (51st National Meeting of Bell-ringers) – Cividale del Friuli, NE Italy – 11th to 12th June 2011. English ringers to display their art on a Veronese mobile frame. Suffolk master ringer Stephen Pettman tells his impressions about Scuola Campanaria di Roncobello’s concert in Grundisburgh.